One of the top attractions in Puerto Vallarta is the Pirate Ship Cruise. Climb aboard one of these amazing ships for some pirate fun. Also known as Puerto Vallarta's Pirate Ship Booze Cruise, they have day or night tours on two different ships. The Marigalante and the Jolly Rodger run Monday through Saturday for day tours and every night for the dinner tour. The day tours leave from the Maritime Terminal. You will need to be there by 9am. Once through the main gates, you will be directed to the booth where you will exchange your ticket for a boarding pass. While waiting for your guides to come get you there are vendors selling mementos. If you have a weak stomach now is the time to take a motion sickness medication. A day tour is sure to please the entire family. It is approximately 7 hours of pure fun which starts the moment you get on board. Featuring exciting pirate shows, singing, sword fights and cannons blasting. It stops at Majahuitas Beach for a real buried treasure hunt. You can also snorkel, swim, ride a banana boat and kayak while here. The breakfast buffet is on the pirate ship cruise but lunch is on the beach. Of course with any booze cruise they offer an open bar. 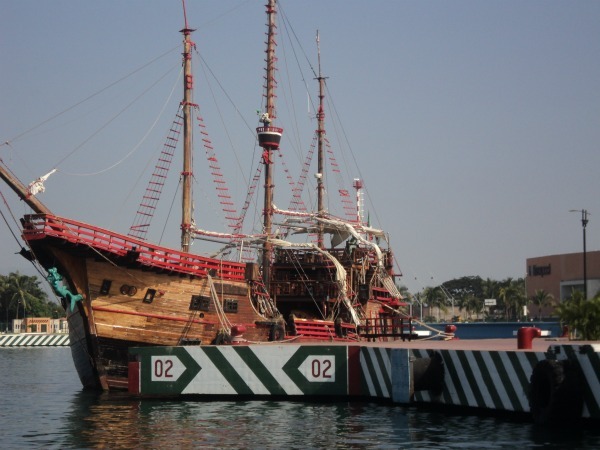 Take a look at this video of the pirate ship. Pirates of The Bay is the nightly tour running every night except Tuesday's. It was originally intended to be adults only but do not be surprised if you find many kids on this Pirate Ship Cruise. It starts at 5:30pm leaving from the Maritime Terminal. It is a five hour cruise. This Puerto Vallarta cruise can be pretty wild with pirate fights breaking out, lots of singing, dancing and you might even find you are being held captive. The audience is encouraged to participate in fun games and contests. You will definitely enjoy the gourmet dinner and the spectacular fireworks show. Tuesday nights are reserved especially for Canadians. The Last Saskatchewan includes everything from the Pirates of The Bay Show but also has a Canadian theme. You should bring a sweater or light jacket for the evening cruise and sunscreen is a must for the day cruise. Although it is all inclusive, they do ask that you tip your crew a minimum of 50.00 pesos or $5.00 US dollars.